Ntsika Architects is situated in the hustle and bustle of the Maboneng precinct in Johannesburg. It is here where Nadia Tromp and her team are changing the urban fabric of the city, one project at a time. “Our focus has been on affecting social change in meaningful ways. This is why we have always been interested in civic projects, especially in marginalised areas, where the need for public buildings is dire. Our work, which includes libraries, clinics and bigger healthcare projects such as hospitals, are in areas that were previously neglected and without any services. This focus is intentional, as this is where we feel we should be putting our energy as architects. We understand Architecture’s role in reducing social vulnerability and we therefore build, research and advocate for architecture that promotes human dignity and social justice,” Tromp explains. At the World Architecture Festival (WAF) held in November last year, Ntsika Architects’ Westbury Clinic was named the winning project in the Health Built Projects category. Ntsika Architects was one of only three South African practices nominated for this prestigious awards and the only practice to win an award for the category nominated. This project is part of the city’s Corridors of Freedom programme to serve communities along the Empire-Perth Corridor connecting Soweto to the central business district (CBD). But how does one balance scarce resources, the use of public money and the requirements for a highly specialised environment? “Healthcare design is very specialised and we work closely with the Department of Health at local government level,” says Tromp. “When it comes to specifying products and materials, one thing that is very specific is the surface material on the floors and walls. Traditionally, linoleum surfaces were commonly used in hospitals. This natural and hygienic product is no longer permitted by the client in primary healthcare facilities. This posed a huge challenge for us to find an alternative product that would meet the stringent health standards. The antibacterial tile selected went through a rigorous vetting process and was approved by the Department of Health. This tile, supplied by Limegreen Sourcing Solutions, prevents the spread of germs and is very easy to maintain. It is a full-bodied porcelain tile with a full-bodied antibacterial application, so if it chips it isn’t noticeable and the function of the tile isn’t compromised,” she explains. Ntsika Architects also includes solar systems and rainwater harvesting in all their clinic designs. In fact, they have just completed a clinic in Noordgesig, Soweto, where the carports are topped with solar panels and designed in such a way to capture optimal sunlight. While a generator provides back-up, on sunny days the power supplied by the solar system is enough to supply the whole clinic. “A big positive is that the city is now looking at rolling out solar with all its primary healthcare projects,” Tromp states. Other important requirements when specifying materials for these specialised, public environments are that they need to be good quality, long-lasting and robust. 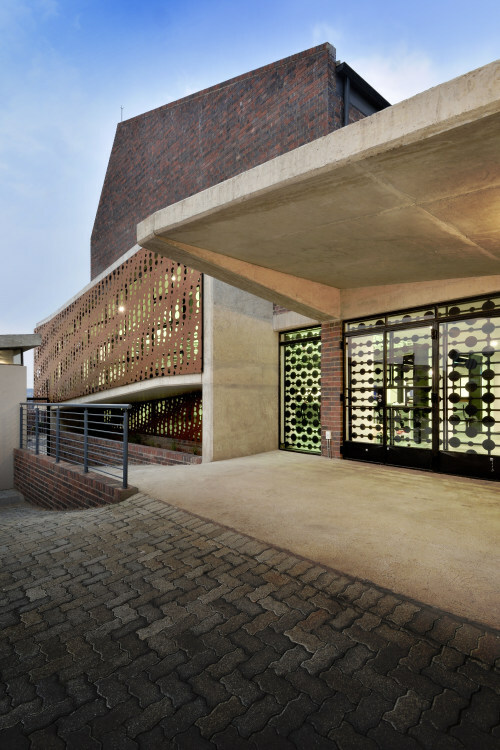 This is why, for the Westbury Clinic, Ntsika Architects specified Corobrik bricks. “The Corobrik brick specified was the perfect material in this harsh environment. It is a robust finish which is low maintenance and reminiscent of the old brick buildings of Johannesburg,” she says. The firm is currently busy with another project in the same area, the Westbury Transformation Development Centre (TDC). This mixed-use development includes offices, an indoor sports hall, a recording studio, a greenhouse and a crèche. For the sports hall, specialised flooring is specified, while acoustics are important in the recording studio. “For the acoustic wall panelling, it would have been easy to specify an off-the-shelf system, but it just didn’t make economic sense. So we looked at the community to see where we can bring local skills. It was decided that the timber panelling would be a bespoke designed item and built by harnessing local craftsmen,” Tromp explains. Westbury Clinic was named winner of the Health Built Projects category of the World Architecture Festival awards last year. “I think it comes down to the approach,” adds Tromp. “For example, orientation, openable windows and the channelling of natural light and ventilation are obvious, non-expensive ways to make a building healthier and greener, and it simply comes through good design principles,” she says. Key in their approach to designing public clinics, Ntsika Architects typically proposes external courtyards that become secondary outdoor waiting rooms in the case of overflows. This helps to prevent the spread of communicable diseases since these open areas are naturally ventilated. For the interior waiting areas, they include openable, high-level, clerestory windows. The design of the building was a challenge since half of the already small site was, and today still is, illegally occupied. Without being able to relocate the people living on site, the building’s floor plan had to be compressed, which resulted in a two-storey clinic. In addition, a ramp was pushed outside of the envelope of the building in order to maximise the internal waiting space. It also serves as an architectural element. In this way, the interior volume is maximised to fit 250 seated patients. Another reason why the project was such a success, according to Tromp, was the fact that 40% local labour was used. “Even though it is a requirement by government, not all contractors are eager to engage with local labourers. But in this instance, Mabra Construction was very willing to train local labourers and transfer high-quality construction skills,” she notes. Steel and metal work is typical skills found in the Westbury community, and these were applied where possible. For example, the shading screens in front of the building were manufactured by local craftsmen, which also make the building more meaningful to the community. The building is set back from the street edge to create a generous public space in front of the building. This allows a humane space for people to wait and cue from early in the morning before the clinic opens. Because security remains a concern, the architects made an intentional effort to create spaces in and around the building that are passively surveyed, without building a fence around the facility. For example, the staff wing is situated along the street facade with windows overlooking the public space. “Creating this public space was a huge achievement because it is an indication that the city is starting to think a bit differently about civic buildings, even in a harsh environment such as Westbury, where the steel theft rate is the highest in South Africa,” states Tromp. 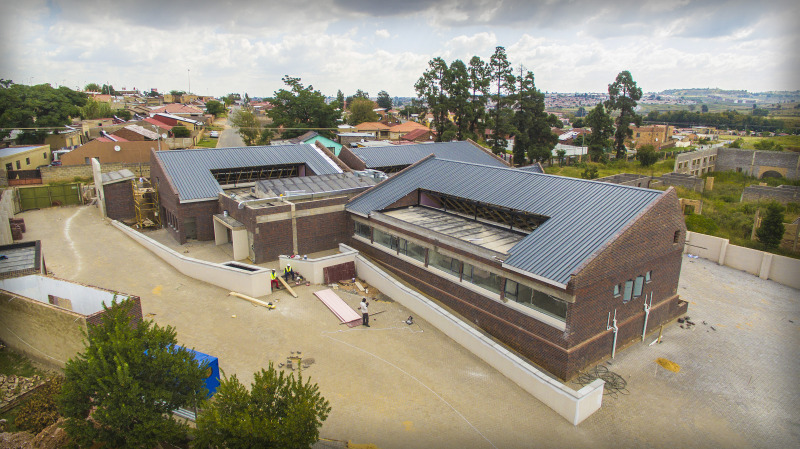 On the Westbury TDC project, community engagement is a big focus for Ntsika Architects. In fact, the firm has started a programme called “The Green Screen Project”, which investigates how to incorporate communities in projects to get them to take ownership of the new infrastructure. In partnership with the Department of Social Development’s food security programme, the community around the Westbury TDC will be taught how to grow their own plants and vegetables. One initiative is that volunteering households in the area will receive a pallet to plant at home and at the end of the project, they get to insert the plants grown onto the building facade, which will also serve as a teaching facility. “It is a privilege to be able to design a building and actually see it realised. In South Africa, we are really fortunate to be in an emerging market where we get to build new buildings where previously there was nothing. This privilege is a responsibility that I don’t take lightly. If we are going to leave a footprint, we need to be considerate of what it will be. I see it as an opportunity to affect change in a concrete way,” Tromp concludes. Full thanks and acknowledgement are given to Nadia Tromp and Ntsika Architects for the information given to write this article. The Noordgesig Clinic, while under construction. At this clinic, the carports are topped with solar panels and designed in such a way to capture optimal sunlight.